Galaxy Gear(s) on deck for MWC 2014? When Samsung likely pulls the wraps off of the next Galaxy Gear during MWC 2014, it might have more than one version on stage. What's more, it may have an OS shock for consumers watching eagerly. According to an in-the-know source of The Verge, Samsung may unveil multiple Galaxy Gear 2s at the Barcelona show. The report doesn't go into what will be different about each smartwatch, though word is circulating Samsung could have some non-Android plans in store as well. A separate report by USA Today suggests a version of the Galaxy Gear 2 will run a new HTML 5 version of Tizen. Rather than using Android, Samsung may slap on the Linux-based OS it built in conjunction with Intel as a carrier-friendly mobile operating system. 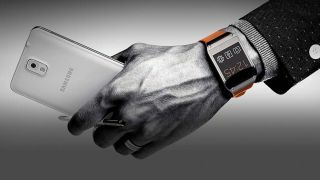 On top of being a custom software package, the lighter HTML 5 base would make it easier for third-party developers to write apps that will run on the new Galaxy Gear. In one form or another Samsung is more than likely planning to make a public showing of its new OS at next week's mega mobile show. While Samsung's new flagship Galaxy S5 is unlikely to come sporting the untested operating system, the Zeq 9000 and ZTE Geek have been leaked as Tizen-touting Tizen smartphones. If Tizen were to show up on a new Galaxy Gear, Samsung could prove its OS works on phones as well as wearable devices in one fell swoop. Whatever happens it remains certain that the Korean device maker will present its OS as interested device makers and carriers wait in the wings. Tizen recently attracted the attention of 15 new partners on top of companies including Huawei, LG and Panasonic and carriers Orange, Vodafone and SK Telecom. There's no shortage of wearable devices these days. To help you cut through all the chaff, here's the best of the smartwatch crop.